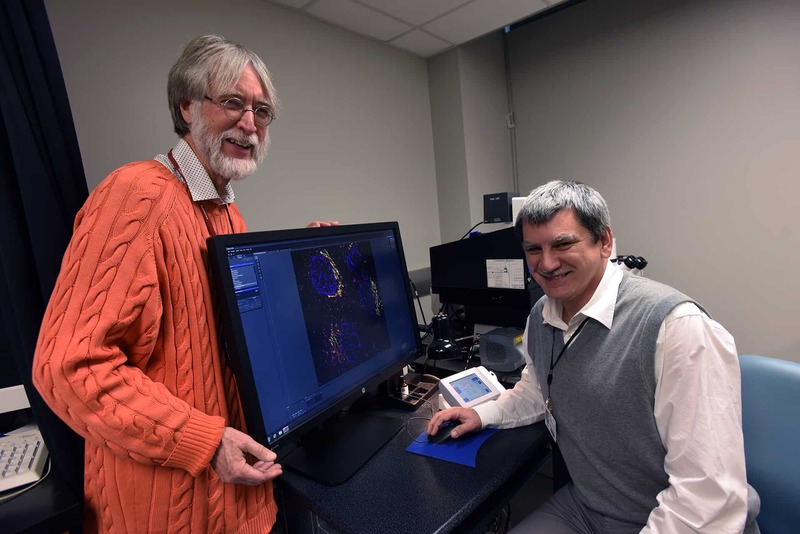 Brian Storrie, Ph.D., left, and Vladimir Lupashin, Ph.D., both professors of physiology and biophysics at UAMS, recently published an article in Nature Photonics on their groundbreaking work in microscopy. Dec. 8, 2016 | Dec. 8, 2016 | A project to develop a new type of microscope with unprecedented speed and resolution has revealed previously unseen parts of human cells, as highlighted in a Nature Photonics article co-authored by two researchers in the College of Medicine at the University of Arkansas for Medical Sciences. Brian Storrie, Ph.D., and Vladimir Lupashin, Ph.D., both professors of physiology and biophysics at UAMS, wrote the article “High-magnification super-resolution FINCH microscopy using birefringent crystal lens interferometers” along with Gary Brooker, Ph.D., and Nisan Siegel, Ph.D., from Johns Hopkins University. The project’s holographic microscope – called FINCH, Fresnel Incoherent Correlation Holography – is a novel approach that can produce 3-D images, has double the resolution power of traditional microscopes and is at least 10 times faster than competing technology. As highlighted in the Nature article, the microscope’s latest advances – made possible by new lens technology – successfully showed three different previously unseen proteins in the Golgi apparatus of human cells. The high level of magnification was also a first for the super-resolved holographic imaging technique. The combined effect was 4,000x net magnification. Storrie has been involved with and an advocate of the holographic microscope project since its beginning almost 20 years ago. He wrote the grant and Lupashin provided the specimens that were used in the latest exploration of the microscope’s capabilities. As the cell biology experts with the project, they have identified areas of research where the microscope’s groundbreaking capabilities can be applied for the greatest impact. Meanwhile, the mechanical work related to building and refining the microscope has taken place at John Hopkins University and Brooker’s company CellOptic. The holographic microscope is expected to have widespread impact on scientific research and the medical profession alike. After many years in development and testing, a commercial prototype is expected to arrive in a UAMS lab in spring 2017. It will be one of five such prototypes in the nation. “I am very proud that Drs. Storrie and Lupashin are doing state-of-the-art cell biology here at UAMS,” said Michael Jennings, Ph.D., chairman of the Department of Physiology and Biophysics. Nature Photonics is a monthly journal that publishes top-quality, peer-reviewed research in photonics – the scientific study and application of light. The latest article on the FINCH project appeared in the December issue, referenced from the cover. Storrie said there are several advantages to the holographic approach. Lupashin joined the project four years ago. In addition to preparing samples, his primary role has been to compare the microscope’s capabilities to other methods. He is most excited about its 3-D capabilities, especially with regard to use on live cell samples. In keeping with UAMS’ educational mission, many students have participated in aspects of the FINCH project over the years. The Golgi imaging work is supported by a nearly $2 million National Institutes of Health grant to UAMS with a sub-award to Johns Hopkins. The instrument development work was funded by a NIH National Cancer Institute grant to CellOptic. Storrie earned his Ph.D. from the California Institute of Technology. Much of his research explores the Golgi apparatus and protein secretion. He has previously secured many grants, including those for a $1.49 million electron microscope constructed at UAMS in 2011 that became the catalyst for the Comprehensive Microscope Imaging Center, which now houses UAMS’ state-of-the-art microscope technologies under one roof. Lupashin earned his Ph.D. from the Russian Academy of Sciences in Moscow. His research explores the molecular mechanisms responsible for membranes within cells, which impacts a wide range of human diseases.